Crossroads are never easy. What do you do when asked to do something you aren’t sure about? Decision making is difficult when it’s your own life and stuff is going down. But what happens when all of a sudden – someone asks something of you that you hadn’t considered before? My first bit of advice is never commit to answering right then and there. Big questions deserve big time outs. People need time to process information before making rash decisions. One of my many flaws is that I am quick to say, “yes, I can help.” I mean it with every fiber in my body. In my heart, I want to help, my brains screams: DO IT, and my hands and feet are ready and willing. So when I was confronted recently with conflicting feelings – I was like a deer caught in the headlights. I was sort of just frozen and tongue-tied and some-how I managed to say that I needed to time to think about it. It was the best decision I made. Whats worse than saying no? Saying yes and then regretting it. I’ve been most fortunate in the times people have asked for my assistance. While I was always so willing to give of my time, energies and support to others, I sometimes neglected my own needs. No one suffered besides me. Being kind has its rewards and what ‘they” say is true. What goes around comes around. That having been said – it applies to the negative as well. Currently I find myself in a position where I am dying to say, I told you so. But it’s not nice to rub it in once the damage is done. I warned someone not to be so trusting. I begged them not to lend funds when they had financial struggles. And now, they are in heaps of trouble. They have asked for my help – not monetarily – but for advice. Advice is free when you are someone like me – but there is always a price to pay. Getting involved on any level now is sure to bring trouble rearing its ugly head in my direction. But can I turn away? Looking at the larger picture, if I were in this person’s shoes – I would seriously hope there would be someone to hold my hand, ease my fears and pray for a positive outcome. I’ve always had my pulse on other people’s feelings and this is really hard for me. On one hand, I KNOW this person needs help. On the other, I am willing myself to say no. I am at a crossroads. The time has come to make a decision and instead of jumping – you know ‘they’ say the older you get the wiser you become – I find myself being more cautious than ever before. I am listening to my own advice; that inner voice, and taking the time to really think it through. Sometimes I wish life was all rainbows and butterflies with rooms full of bowls of ice cream and buckets of peanut chews. I wish I had an amazing sense of humor and a quick wit to get myself out of potentially sticky situations. But – that’s not me. I’m the one that took 3 days and then FINALLY had a comeback. I can not even count the times my brother face-palmed when I finally spit it out. There is one consolation to all this. At least it wasn’t me. I am a very trusting person as well, in theory this problem may have been mine if I were in a state of tenderheartedness for someone’s sob-story. I am not the one in trouble and I have the answers this person needs. I just need to remember not to say, “I told you so”, which is going to be really hard. The reason for my hesitation? If this person really respected my opinion, they would have listened to me in the first place. They could have avoided this issue all-together, what makes me think they will listen now? Why should I spend my energies on someone who has proven not to listen to me in the past? I am a firm believer in the fact that G-d give us only a certain amount of words to use on this earth. I weigh my words very carefully and I wonder if this is an exercise in futility. …otherwise known as ‘Overworked And Underwhelmed’. You must know what I’m talking about. When you get into that rut at work, where you used to be content with the day-to-day business of whatever field you are in, but now it seems tedious and you start getting a case of the blahblahs. Personally I feel there is nothing worse at work than being bored. Well scratch that. Having a boss that is rude and not compassionate could be worse than that. But being bored is pretty bad. I am thankful that this is not my current case, sort of. I am so busy at work that my brain is thinking faster than my computer (time to get a new computer) and I*am*frustrated. The fact that I can’t pound through the filing/faxing/photo copying/scanning/emailing faster is making me feel discouraged. Also – I love what I do – in theory- but not in the practical menial task sense. I am polar opposites at work and home. At work I can not stand when there are piles left – I MUST GET TO THE BOTTOM OF MY PILE when I have one taking up room on my desk. At home though? Maybe because I am so wiped out, I mentally check out, because I can guarantee almost 99% of the time, that laundry pile can stay put until I am good and ready to tackle it. The day is coming to a close and though I feel accomplished I am at the mercy of others. This too is a contributing factor in the case of the blahblahs. I can be part of a team. In fact, I am a really good team-player. When I have to wait for others to do their share and it makes me look inefficient, I get understandably cranky. When there is a time crunch and the other team members are dragging their feet and not communicating properly it’s enough for you (read me) to really get bleepity-bleep. But I am letting it go. Listening to my own advice. Getting angry won’t help the work get done any faster. Deep Breathing. Eye-twitching. Wearing a turtle-neck sweater so no one can see the neck blotching, oh right deep breathing. I will be okay as soon as I get some fresh air. 4:54 PM, not long now ’til I bolt out of the doors and move on to the next task, dinner. Now, how can I make eggs exciting? It is unbelievable the amount of time I ‘waste’ on following my friend’s feeds or reading articles that they post or videos that they link. While I am fascinated by everything and really use this feed as my new source as well, not just for silly stuff and gossip, I often justify the amount of time I spend. Sometimes I get caught up in looking at their cat’s amazing feat videos – which is cute, I guess, but definitely a waste of my time and better judgement. 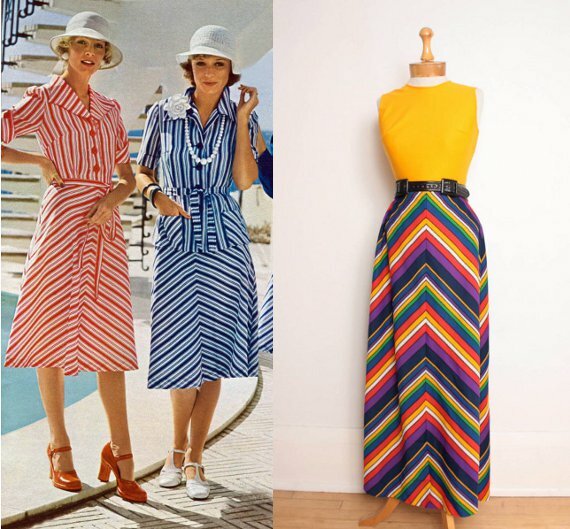 But, then, there are times when one thing leads to another, as is typical when one is surfing the internet, and you find something that makes you think, inspires you to write and giggle, and takes you back to a different time in your life when a dress like this (featured left) was in style. But wait, it gets better, this is a dress that is currently selling by someone with celebrity status…which naturally will make it trendy somewhere (probably LA) today! The cowl neck? Seriously? The color scheme and pattern of this frock have sent my neurons a-flurry. Not in a good way. I guess this is what is called retro. I did have a sweater dress, once. I did wear these patterns and color schemes, once. It was called the 70’s. While any gorgeous model looks amazing in anything you throw on her, because she is gorgeous, this particular outfit placed on any housewife with a muffin top or a double chin? – this piece is a no-no. Not like I’m the expert. We’ve covered that ground how I should never be regarded as a fashionista, but I do know what the average mom probably would say about this if she saw it on the racks in Macy’s. Labeled as ‘multicolored chevron stripe decoration’ – last time I checked Chevron was a company dedicated to producing safe energy. Perhaps because of Chevron’s logo? The name of this pattern was born…artists are so weird. Designers fall into the category of artist – and don’t get me wrong… I LOVE DESIGNERS AND DESIGN SHOWS, for realz…sadly. I do have some anti-very-negative-feelings about artists. They are weird. Okay, now I know I sound elitist a bit by condemning artists and cat videos, but I’m not, I accept that we are all a bit weird in some way or another. Now, thanks to my FaceBook tour, today I have hit the fashion industry once again…which I am so fascinated by but haven’t a clue how to subscribe to it myself personally. I have been thrown back into the 70’s where this image came to my mind. Not exactly – since I don’t know those 2 models – but they could have been my mom and me. I sported those pigtails (and ribbons – see Losing to Iris Melman) and my mom had a similar hairdo. 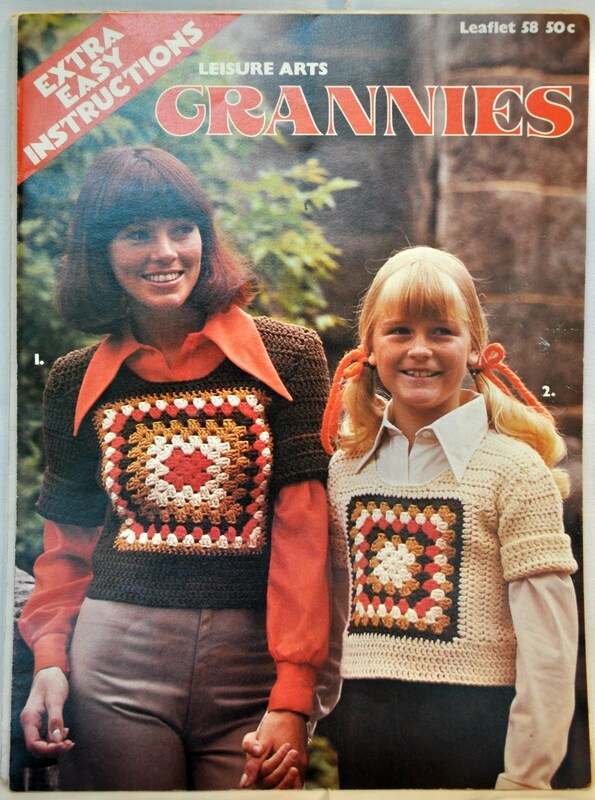 Plus, as a side-note, my parents have an afghan still today that looks like the same pattern displayed on the cover of this issue of Grannies. Aah the memories. I do love a good vest though. If I were a total gaming nerd, I’d so wear this Mario knitted vest. When I was shopping one winter in NYC, I managed to pick up a holiday motif sweater that a wonderful Chinese sales clerk sold to me referring to it as my “Chwitzmas Swetta” – not even trying to be funny. When I told her I was Jewish she exclaimed that she could not sell it to me in good conscious. I was a bit taken aback because now, of course, I HAD TO HAVE THAT SWEATER on principle. It wasn’t like there were any religious significant knitted designs on it. There were snowflakes. Sure enough I purchased the hideous thing – that reverse psychology worked wonders on me, the stupid consumer that I was, and I even wore said cardigan on a blind date once. Man, that train of thought is just like internet searching. One thing leading to another, when you end up someplace you really hadn’t planned on going. It’s for this reason that I love FaceBook (well one of the many). I do learn a lot and often use Wikipedia to search for terms like ‘moonbat” and “speculative realism”. I love that FB takes me back in time and helps me remember all those stories and amazing fashions and music when I was a kid from the 70’s. Its no “Back to the Future” but its pretty fun to look back and appreciate where we’ve come from and even more so appreciate where we are now, which after about 45 years is pretty much where we left off. Too bad these dresses aren’t made in afghan-wool-sweater-wear…I could have started a new chevron sweater trend…maybe. I used to know. I remember when it was easier but I didn’t think so at the time. I was “Chubby”. I was happy. I was short. I was shy. I was average. I didn’t stand out, wasn’t opinionated, always had at least 1 or 2 best friends. Identifying who we are or how we want to be perceived varies depending on where we are in our lives. Turning point? I was 11 years old when I answered that question for the first time. Because of a virus, my kidney’s stopped working and I was placed in the ICU of the pediatric ward in Newark, New Jersey’s Beth Israel Medical Center. I didn’t think of myself as the girl with the IV pole, or the girl in a wheelchair, or the girl with a pee-bag, or the kid in dialysis. I was the girl with purple arms. That was the first time I identified myself as being unique, different, not like anyone else. I remembered asking my mother if I would ever look normal again. She explained about the procedures of taking blood so often leaving my arms purple and that eventually the skin wouldn’t be bruised and I’d return to “normal”. As a parent today I can’t imagine what that must feel like to have to answer such a question. In high-school I was “Chubby”. I was happy. I was short. I was shy. I was average. I didn’t stand out, wasn’t opinionated, always had at least 1 or 2 best friends. The next time I was aware of asking myself this question was when I was confronted as a high-school student by a youth group administrator. He felt my friends were bad influences on me and mentioned how he thought I should look for a new group friends. Horrified and angry because as a teenager you define yourself by your associations. They were my people. I was part of them, we all thought the same things, acted the same way, made each other laugh and they were always looking out for me, protecting me, were protective of me. I was the girl everyone loved to protect. I didn’t understand why he’d say such a hurtful statement but after we went our separate ways and I was able to see things from a different perspective, I understood what he was trying to tell me. Still, I didn’t love it, but I got it. I wasn’t anybody in my own right. I had to ask the question, who am I? Spending the summer away from my core peer group gave me new insights. I lived abroad meeting new people, some from other countries and again I was confronting myself, defining the kind of person I wanted to be. Excited to begin college, a year and a half later, I was ready for change. I was the student who started on probation and finished making Deans List and on my way to getting a degree. I was a Ranger’s fan. I was a youth group adviser. I was the owner of a goldfish. I was the bridesmaid. I graduated and received a service award because I wasn’t only studying, proving to myself that I was smart enough if I just applied myself. I worked at making it an experience to remember including all aspects of dorm, social and academic life. I was “Chubby”. I was happy. I was short. I was no longer shy. I was better than average. I didn’t stand out more than the next guy. I started to form my own opinions. I always had at least 1 or 2 best friends. Now, after being married for almost 15 years, having 5 children, working at 8 various jobs and the proud owner of a domain name I am at that place once again. How do I define myself? I am a blogger. I am a glorified secretary. I am a mother, a friend, an Israeli, an American, a Jew. I am 40. I am “Chubby”. I am happy. (when I’m not crying). I am still annoyingly short. I am reserved and thoughtful. I am trying to not be average. I want to stand up for what I believe in. I formulate my opinions based on educating myself and listening to others. I still have at least 1 or 2 best friends. I am secure (but I still won’t eat by myself in a restaurant). I am confident (but I still don’t like being the center of attention). I am sensitive (to the point of no return – can we say BIG FAT CRY BABY?). I am funny (and often embarrass myself just to get a good laugh). I am creative (and doodle most of the time during office meetings) . I am still evolving. Change is good, growth is necessary. I look forward to asking myself this question 5 years from now. Challenge of the day. Can you answer this question?